The talk received a standing ovation from the crowd. 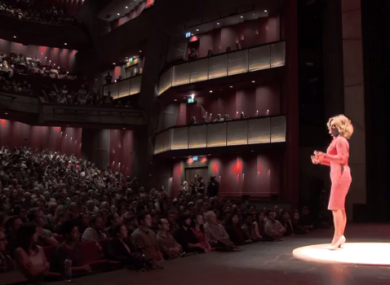 PANTI’S TEDx TALK addressed the experience of the little everyday things can have a huge impact on the lives of gay people. She describes how she’s jealous of straight couples who can mindlessly hold hands in public without a second thought. “Everyday I am jealous of straight people because that tiny intimate expression of affection has never once been mine. I am jealous of that because gay people do not get to hold hands in public without first considering the risk. I’m 45 years old and I have never once casually, comfortably, carelessly held hands with a partner in public. You get fed up of people using their time and energy and talents to campaign against you being treated just like every other citizen. “I’m 45 and I’m fed up of putting up so I’m not anymore. “I’m 45 years old and I’m not putting up anymore because I don’t have the energy anymore…putting up is exhausting. “I’m 45 years old and I’m not putting up anymore because I don’t have the patience anymore. Email “Panti's Tedx talk: 'I'm 45 and I've never got to hold hands in public without first considering the risk'”. Feedback on “Panti's Tedx talk: 'I'm 45 and I've never got to hold hands in public without first considering the risk'”.